Dr Ronan Desmond (Consultant Haematologist, Tallaght University Hospital). Register before Monday 29th April 2019 via https://www.eventbrite.co.uk/e/cpd-event-on-advanced-therapy-medicinal-products-atmps-pharmacistspharmacy-students-tickets-59794300362?aff=ebdssbdestsearch. Attendance at this meeting is free for PIER and HPAI members. PIER in collaboration with EIPG is delighted to organise a webinar on 3D printing on Wednesday 30th April 2019 at 4pm. Our speaker is pharmacist Dr Alice Melocci from Milan who was selected as one of the "Inspiring Fifty -Italy" , i.e. the 50 women of greatest inspiration in technology in Italy in 2018. See flyer for further information 3D printing webinar_30th April 2019. 3D printing enables fabrication of solid objects, of almost whatever shape, starting from their digital model through the addition of successive layers of material (i.e. additive manufacturing). Currently, such a technique is widely employed in many industrial fields due to the advantages it would provide in terms of versatility (e.g. shape, dimensions, compositions of products) and reduction in time and costs associated with either production (i.e. small, personalized batches) or development (real time prototyping capability). Within the nutraceutical and pharmaceutical areas, the interest in 3D printing is rising together with that in personalized medicine, envisaging treatments tailored to specific patient needs. Results relevant to the application of fused deposition modeling (FDM) 3D printing to these particular fields, including its prototyping ability with respect to other hot-processing techniques (injection molding), fabrication of capsular devices and 4D printing will be presented. Limitations to the use of 3D printing for pharmaceuticalproduction still need to be faced mainly in connection with starting materials, manufacturing, evaluation of quality and related regulatory aspects. Preliminary attempts to overcome these issues and employ FDM in the manufacturing of dietary supplements were performed by the startup Multiply Labs and will also be discussed in this presentation. manufacturing of dosage forms and delivery systems. Further instructions will then be sent by e-mail. PIER is organising a career information event for pharmacists interested in making the transition to an industry role in RCSI on Wed evening 15th May 2019 from 7pm PIER Career Transition Information Evening RCSI_15th May 2019. 21.30 Networking (retire to local hostelry). To register, email piercareerevents@gmail.com. Non-PIER members welcome. The support of the RCSI Career Development Manager Fionnuala Rahilly in organising this event is acknowledged. The Baxter Healthcare Ltd Compounding Facility in Dublin operates to a Manufacturing Authorization awarded by the Health Products Regulatory Authority (HPRA). Sterile batch and patient specific products are manufactured using isolator technology in a clean room environment. Baxter provides a broad portfolio of essential renal and hospital products, including home, acute and in-centre dialysis; sterile IV solutions; infusion systems and devices; parenteral nutrition. Baxter Healthcare are currently recruiting for both a Quality Specialist and a Quality Batch Releaser at their Deansgrange site. Join us at the PIER Speednetworking event in The Hairy Lemon, Lower Stephen Street, Dublin on Friday 22nd March 2019 from 7.30pm. Great opportunity to meet like minded pharmacists working in or interested in working in the pharma sector. Email membership@pier.ie to register. The HPRA are currently recruiting for a Pharmaceutical Assessor in the Pharmaceutical Assessment (HPAR). Closing date for application is 6th March 2019. 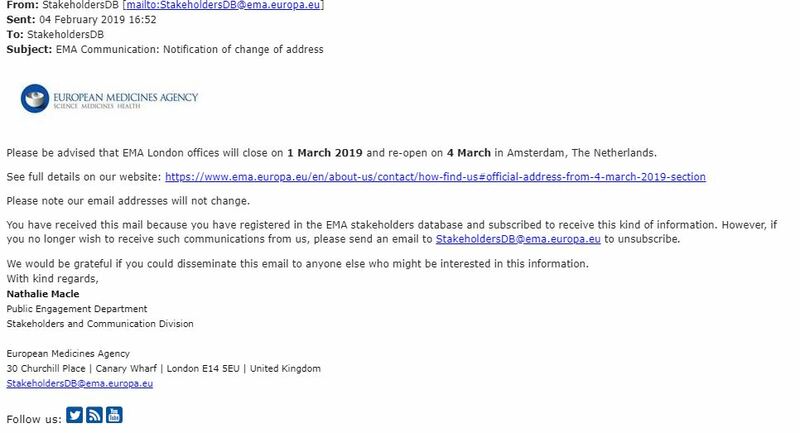 See recent update from EMA re move from London to Amsterdam Stakeholder update re EMA relocation to Amsterdam. PIER is delighted to collaborate with EIPG to organise a Webinar on the topic of 'Recent Advances in the Management and Prevention of Alzheimer's Disease and other Dementias' to be held on 27th February 2019 at 4.00pm UK/Irish time (5.00pm CET). This is aimed at members working in the clinical areas of industry, particularly clinical trials management. The speaker, Dr Vanessa Raymont is a member of the Department of Psychiatry at the University of Oxford, and at the Centre for Dementia Prevention in the University of Edinburgh’s Centre for Clinical Brain Sciences. She is currently working as part of the EPAD (European Prevention of Alzheimer’s Dementia) Consortium to establish a panEuropean network of Trial Delivery Centres to undertake Proof of Concept secondary trials for prevention of Alzheimer’s dementia. The webinar is free of charge to PIER members. Anyone wishing to participate should register via the link in the attached flyer EIPG PIER webinar on Alzheimers & other Dementias.